Ben Kendall was a troubled man. Coming back from Vietnam with PTSD and scars that no one else could see, he hid away from the world, filling his house with an ever-increasing amount of stuff, until finally, the piles collapsed and he was found dead, crushed beneath his own belongings. But what at first glance looks to be a tragic accidental death of a hoarder, may be something much more—and much deadlier. Ben's cousin, medical examiner Beverly Hillstrom, unsettled by the circumstances of his death, alerts Joe Gunther and his Vermont Bureau of Investigation team. Ben, it seems, brought back something else from Vietnam than personal demons—he also brought back combat photos and negatives that someone else wants desperately to keep from the public eye. When Beverly's daughter Rachel made her cousin Ben—and his photos—the subject of her college art project, some of those photos appeared on the walls of a local art gallery. This in turn resulted in the appearance of a two man hit squad, searching for some other missing negatives. With Joe Gunther and his squad trailing behind the grisly research results of the hit team, and the deadly killers closing in on Rachel, Gunther has little time to find and protect Rachel before she ends up in the same grisly state as her cousin before her. 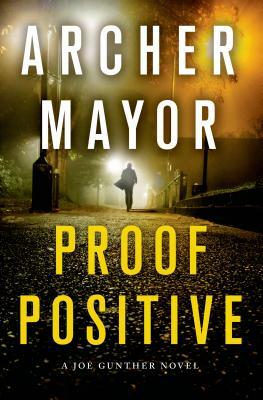 Archer Mayor's Proof Positive is another enthralling installment in the Joe Gunther Series.